It is no secret that I am quite fascinated by the the idea that social media data might be very useful as early/leading indicators of macroeconomic variables. Said in another way I think that social media activity can be seen as a form of prediction markets. So recently I have been tracking what Google Trends is saying about the development in searches for different terms that might give an indication about whether we are heading for a recession in the US economy. Lets start with the world ‘recession’. The picture is not dramatic and the Google searches for ‘Recession’ clearly is much lower than at the onset of the Great Recession in 2007-8. That said, there has recently been a relatively clear pick up in the ‘recession indicator’ that could indicate that ‘Google searchers’ are increasingly beginning to worry about the US economy entering a recession. How about the labour market? This is Google searches for ‘Unemployment’. This is much more alarming – there has been a very steep rise in Google searches for ‘Unemployment’. In fact the rise is more steep than it was in 2008. This certainly is an indication of a very sharp deterioration of US labour market conditions right now. The question then is whether Google searches have any prediction power and here the evidence is quite clear that, that is indeed the case. At least that is the conclusion in a recent paper – The Predictive Power of Google Searches in Forecasting Unemployment – by Francesco D’Amuri and Juri Marcucci. Janet Yellen’s Federal Reserve have been extremely eager to say that inflation would soon rise due to the continued decline in unemployment and has essentially ignored all monetary and market indicators, which for a long time have indicated that monetary conditions should not be tightened as fast as the Fed has signaled. That in my view is the main reason why US economic activity now is slowing significantly in and paradoxically that will now very likely push up unemployment. In fact if we trust the signals from Google searches then we are in for a significant deterioration in labour market conditions in the US very soon. So while the Yellen-Fed seems to ignore monetary indicators at least the fact that unemployment might soon shoot up again should tell the Fed that it is time to dramatically change course. In fact it now seems more likely that we will have a new round of Quantitative Easing in the next couple of quarters rather than more rate hikes. Or at least that is what the Fed should do to avoid another recession. PPS I seriously thought that Janet Yellen was well-aware of the dangers of repeating the mistakes of 1937. Apparently I was wrong. The ECB’s large scale quantitative easing programme already has had some success – initially inflation expectations increased, European stock markets performed nicely and the euro has continued to weaken. This overall means that this effectively is monetary easing and that we should expect it to help nominal spending growth in the euro zone accelerate and thereby also should be expected to curb deflationary pressures. However, ECB Mario Draghi should certainly not declare victory already. Hence, inflation expectations on all relevant time horizons remains way below the ECB’s official 2% inflation target. In fact we are now again seeing inflation expectations declining on the back of renewed concerns over possible “Grexit” and renewed geopolitical tensions in Ukraine. Draghi has – I believe rightly – been completely frank recently that the ECB has failed to ensure nominal stability and that policy action therefore is needed. However, Draghi needs to become even clearer on his and the ECB’s commitment to stabilise inflation expectations near 2%. Obviously Mario Draghi cannot be happy that inflation expectations once again are on the decline, but he could and should also see this as an opportunity to tell the markets about his clear commitment to ensuring nominal stability. I think the most straightforward way of doing this is directly targeting market inflation expectations. That would imply that the ECB would implement a Robert Hetzel style strategy (see here) where the ECB simply would buy inflation linked government bonds (linkers) until markets expectations are exactly 2% on all relevant time horizons. The ECB has already announced that its new QE programme will include purchases of linkers so why not become even more clear how this actually will be done. A simple strategy would simply be to announce that in the first month of QE the ECB would buy linkers worth EUR 5bn out of the total EUR 60bn monthly asset purchase, but also that this amount will be doubled every month as long as market inflation expectations are below 2% – to 10bn in month 2, to 20bn in month 3 and 40bn in month 4 and then thereafter every month the ECB would buy linkers worth EUR 60bn. Given the European linkers market is fairly small I have no doubt that inflation expectations very fast would hit 2% – maybe already before the ECB would buy any linkers. In that regard it should be noted that in the same way as a central bank always weaken its currency it can also always hit a given inflation expectations target through purchases of linkers. Draghi needs to remind the markets about that by actually buying linkers. That I believe would be a very effective way to demonstrate the ECB’s commitment to hitting its inflation target, but it would also be a very effective ‘firewall’ against potential shocks from shocks from for example the Russian crisis or a Grexit. A number of European countries issue inflation-linked bonds. From these bonds we can extract market expectations for inflation. These bonds provide the ECB with a potential very strong instrument to fight deflationary risks. My suggestion is simply that the ECB announces a minimum price for these bonds so the implicit inflation expectation extracted from the bonds would never drop below 1.95% (“close to 2%”) on all maturities. This would effectively be a put on inflation. How would the inflation put work? Imagine that we are in a situation where the implicit inflation expectation is exactly 1.95%. Now disaster strikes. Greece leaves the euro, a major Southern Europe bank collapses or a euro zone country defaults. As a consequence money demand spikes, people are redrawing money from the banks and are hoarding cash. The effect of course will be a sharp drop in money velocity. As velocity drops (for a given money supply) nominal (and real) GDP and prices will also drop sharply (remember MV=PY). As velocity drops inflation expectations would drop and as consequence the price of the inflation-linked bond would drop below ECB’s minimum price. However, given the ECB’s commitment to keep inflation expectations above 1.95% it would have either directly to buy inflation linked bonds or by increasing inflation expectations by doing other forms of open market operations. The consequences would be that the ECB would increase the money base to counteract the drop in velocity. Hence, whatever “accident” would hit the euro zone a deflationary shock would be avoided as the money supply automatically would be increased in response to the drop in velocity. QE would be automatic – no reason for discretionary decisions. In fact the ECB would be able completely abandon ad hoc policies to counteract different kinds of financial distress. This would mean that even if a major European bank where to collapse M*V would basically be kept constant as would inflation expectations and as a consequence this would seriously reduce the risk of spill-over from one “accident” to another. The same would of course be the case if Greece would leave the euro. When I wrote all this in 2012 it seemed somewhat far-fetted that the ECB could implement such a policy. However, things have luckily changed. The ECB is now actually doing QE, Mario Draghi clearly seems to understand there needs to be a focus on market inflation expectations (rather than present inflation) and the ECB’s QE programme seems to be quasi-open-ended (but still not open-ended enough). Therefore, building a linkers-based ‘firewall’ would only be a natural part of what the ECB officially now has set out to do. PS I would have been a lot more happy if the ECB would target 4% NGDP growth (level targeting) rather than 2% or at least make up for the failed policies over the past 6-7 years by overshooting the 2% inflation target for a couple of years, but a strict commitment to build a firewall against velocity-shocks and keeping inflation expectations close to 2% as suggested above would be much better than what we have had until recently. From the onset of the Great Recession in 2008 the ECB has been more afraid of doing “too much” rather than too little. The ECB has been obsessing about fiscal policy being too easy in the euro zone and about that too easy monetary policy would create bubbles. As a consequence the ECB was overly eager to hike interest rates in 2011 – way ahead of the Federal Reserve started to talk about monetary tightening. The paradox is that the ECB now is in a situation where nobody can imagine that interest rates should be hiked anytime soon exactly because the ECB’s über tight monetary stance has created a deflationary situation in the euro zone. As a consequence the ECB under the leadership (to the extent the Bundesbank allows it…) of Mario Draghi is trying to come up with all kind of measures to fight the deflationary pressures. Unfortunately the ECB doesn’t seem to understand that what is needed is open-ended quantitative easing with proper targets to change the situation. Contrary to the situation in Europe the financial markets are increasing pricing in that a rate hike from the Federal Reserve is moving closer and the Fed will be done doing quantitative easing soon. Hence, the paradox is that the Fed is “normalizing” monetary policy much before the ECB is expected to do so – exactly because the Fed has been much less reluctant expanding the money base than the ECB. The tragic difference between monetary policy in the US and Europe is very visible when we look at the difference in the development in nominal GDP in the euro zone and the US as the graph below shows. 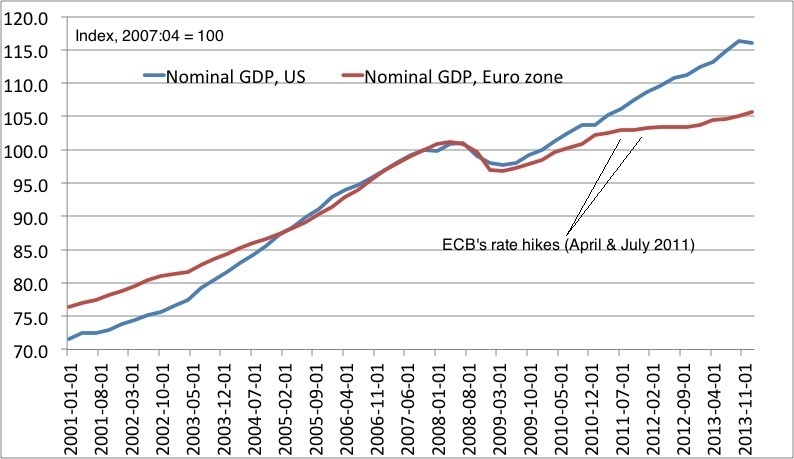 The story is very simple – while both the euro zone and the US were equally hard hit in 2008 and the recovery was similar in 2009-10 everything went badly wrong when the ECB prematurely started to hike interest rates in 2011. As a result NGDP has more or less flat-lined since 2011. This is the reason we are now seeing outright deflation in more and more euro zone countries and inflation expectations have dropped below 2% on most relevant time horizons. While the Fed certainly also have failed in many ways and monetary policy still is far from perfect in the US the Fed has at least been able to (re)create a considerable degree of nominal stability – best illustrated by the fact that US NGDP basically has followed a straight line since mid-2009 growing an average of 4% per year. This I believe effectively is the Fed’s new target – 4% NGDP level targeting starting in Q2 of 2009. I believe it is about time the ECB fully recognizes the mistakes of the past – particularly the two catastrophic “Trichet hikes” of 2011. A way forward could be for the ECB to use the performance of the Fed over the last couple of years as a benchmark. After all the Fed has re-created a considerable level of nominal stability and this with out in any having created the kind of runaway inflation so feared in Frankfurt (by both central banks in the city). So here is my suggestion. The ECB’s major failure started in April 2011 – so let that be our starting point. And now lets assume that we want a 4% NGDP path starting at that time. With 2% potential real GDP growth in the euro zone this should over the cycle give us 2% euro zone inflation. 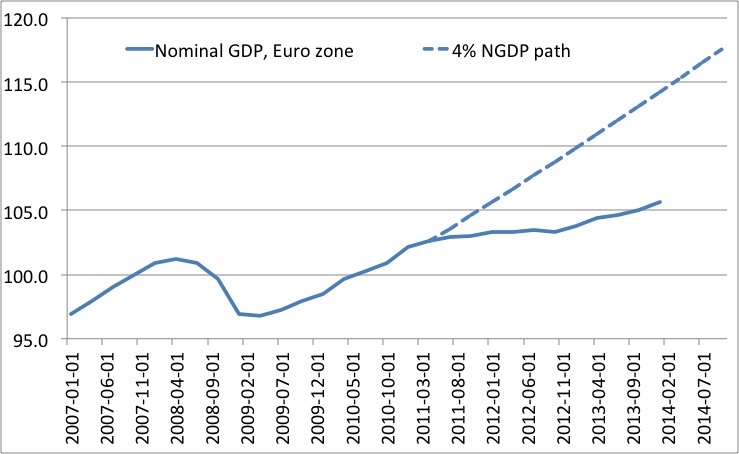 The graph below illustrate the difference between this hypothetical 4% path and the actual level of euro zone NGDP. The difference between the 4% path and the actual NGDP level is presently around 7.5%. The only way to close this gap is by doing aggressive and open-ended quantitative easing. My suggestion would be that the ECB tomorrow should announce the it will close ‘the gap’ as fast as possible by doing open-ended QE until the gap has been closed. Lets pick a number – lets say the ECB did EUR 200bn QE per month starting tomorrow and that the ECB at the same time would announce that it every month would monitor whether the gap was closing or not. This of course would necessitate more than 4% NGDP growth to close the gap – so if for example expected NGDP growth dropped below for example 6-8% then the ECB would further step up QE in steps of EUR 50bn per month. In this regard it is important to remember that it would take as much as 8% yearly NGDP growth to close the gap in two years. Such policy would course be a very powerful signal to the markets and we would likely get the reaction very fast. First of all the euro would weaken sharply and euro equity prices would shoot up. Furthermore, inflation expectations – particularly near-term inflation expectations would shoot up. This in itself would have a dramatic impact on nominal demand in the European economy and it would in my opinion be possible to close the NGDP gap in two years. When the gap is closed the ECB would just continue to target 4% NGDP growth and start “tapering” and then gradual rate hikes in the exact same way the Fed has done. But first we need to see some action from the ECB. So Draghi what are you waiting for? Just announce it! PS some would argue that the ECB is not allowed to do QE at all. I believe that is nonsense. Of course the ECB is allowed to issue money – after all if a central bank cannot issue money what is it then doing? The ECB might of course not be allowed to buy government bonds, but then the ECB could just buy something else. Buy covered bonds, buy equities, buy commodities etc. It is not about what to buy – it is about increasing the money base permanently and stick to the plan. PPS Yes, yes I fully realize that my suggestion is completely unrealistic in terms of the ECB actually doing it, but not doing something like what I have suggested will condemn the euro zone to Japan-style deflationary pressures and constantly returning banking and public finances problems. Not to mention the risk of nasty political forces becoming more and more popular in Europe. I often ask myself what Milton Friedman would have said about the present crisis and what he would have recommended. I know what the Friedmanite model in my head is telling me, but I don’t know what Milton Friedman actually would have said had he been alive today. I might confess that when I hear (former?) monetarists like Allan Meltzer argue that Friedman would have said that we were facing huge inflationary risks then I get some doubts about my convictions – not about whether Meltzer is right or not about the perceived inflationary risks (he is of course very wrong), but about whether Milton Friedman would have been on the side of the Market Monetarists and called for monetary easing in the euro zone and the US. However, today I got an idea about how to “test” indirectly what Friedman would have said. My idea is that there are economies that in the past were similar to the euro zone and the US economies of today and Friedman of course had a view on these economies. Japan naturally comes to mind. So Friedman was basically telling the Bank of Japan to do quantitative easing – print money to buy government bonds (not to “bail out” the government, but to increase the money base). What were the economic conditions of Japan at that time? The graph below illustrates this. I am looking at numbers for Q3 1997 (which would have been the data available when Friedman recommended QE to BoJ) and I am looking at things the central bank can influence (or rather can determine) according to traditional monetarist thinking: nominal GDP growth, inflation and money supply growth. The blue bars are the Japanese numbers. Now compare the Japanese numbers with the similar data for the euro zone today (Q1 2012). The euro zone numbers are the red bars. Isn’t striking how similar the numbers are? Inflation around 2-2.5%, nominal GDP growth of 1-1.5% and broad money growth around 3%. That was the story in Japan in 1997 and that is the story in the euro zone today. Obviously there are many differences between Japan in 1997 and the euro zone today (unemployment is for example much higher in the euro zone today than it was in Japan in 1997), but judging alone from factors under the direct control of the central bank – NGDP, inflation and the money supply – Japan 1997 and the euro zone 2012 are very similar. Therefore, I think it is pretty obvious. If Friedman had been alive today then his analysis would have been similar to his analysis of Japan in 1997 and his conclusion would have been the same: Monetary policy in the euro zone is far too tight and the ECB needs to do QE to “rejuvenate” the European economy. Any other view would have been terribly inconsistent and I would not like to think that Friedman could be so inconsistent. Allan Meltzer could be, but not Milton Friedman. * Broad money is M2 for Japan and M3 for the euro zone. “If the Fed launched another round of quantitative easing, Mr Williams suggested that buying mortgage-backed securities rather than Treasuries would have a stronger effect on financial conditions. “There’s a lot more you can buy without interfering with market function and you maybe get a little more bang for the buck,” he said. He added that there would also be benefits in having an open-ended programme of QE, where the ultimate amount of purchases was not fixed in advance like the $600bn “QE2” programme launched in November 2010 but rather adjusted according to economic conditions. Williams is talking about open-ended QE. This is exactly what Market Monetarists have been recommending. The Fed needs to focus on the target and not on how much QE to do to achieve a given target. Let the market do the lifting – we call it the Chuck Norris effect! Dajeeps is a frequent commentator on this blog and the other Market Monetarist blogs. Dajeeps also writes her own blog. Dajeeps’s latest post – The Implications of the Sumner Critique to the current Monetary Policy Framework – is rather insightful and highly relevant to the present discussion about whether the Federal Reserve should implement another round of quantitative easing (QE3). Said in another way – the Fed’s biggest enemy is itself. If another round of quantitative easing (QE3) would work then it likely would push US inflation above the quasi-official inflation target of 2%. However, the Fed has also “promised” the market that it ensure that it will fulfill this target. Hence, if the inflation target is credible then any attempt by the Fed to push inflation above this target will likely meet a lot of headwind from the markets as the markets will start to price in a tightening of monetary policy once the policy starts to work. We could call this the Dajeeps Critique. I strongly agree with the Dajeeps Critique and for the same reason I am quite skeptical about the prospects for QE3. 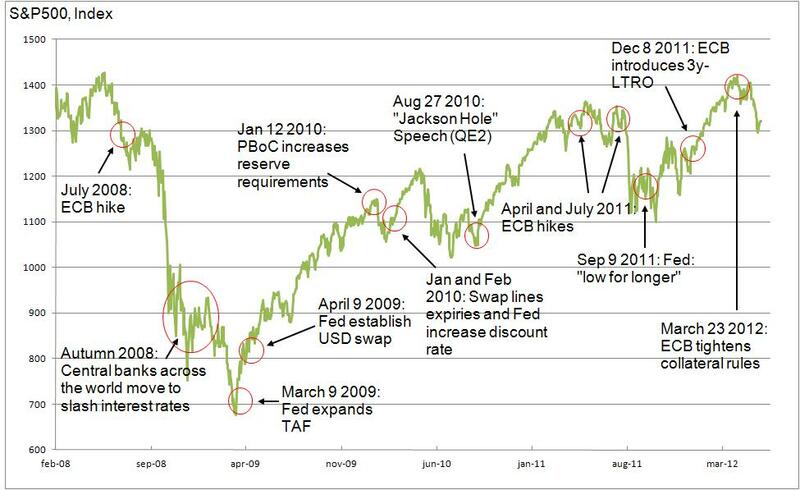 Contrary to Dajeeps I do not oppose QE3. In fact I think that monetary easing is badly needed in the US (and even more in the euro zone), but I also think that QE3 comes with some very serious risks. No, I do not fear hyperinflation, but I fear that QE3 will not be successful exactly because the Fed’s insistence on targeting inflation (rather than the price LEVEL or the NGDP LEVEL) could seriously hamper the impact of QE3. Furthermore, I fear that another badly executed round of quantitative easing will further undermine the public and political support for monetary easing – and for NGDP targeting as many wrongly seem to see NGDP targeting as monetary easing. While I am skeptical about QE3 because I fear that Fed would once again do it in the wrong I would nonetheless vote for another round of QE if I was on the FOMC. But I must admit I don’t have high hopes it would help a lot if it would be implemented without a significant change in the way the Fed communicates about monetary policy. At the core of the problems with QE in the way the Fed (and the Bank of England) has been doing it is that it is highly discretionary in nature. It would be much better that we did not have these discussions about what discretionary changes in policy the Fed should implement. If the Fed had a proper target – a NGDP level target or a price level target – then there would be no discussion about what to expect from the Fed and even better if the policy had been implemented within the framework of a futures based NGDP level target as Scott Sumner has suggested then the money base would automatically be increased or decreased when market expectations for future level of nominal GDP changed. For these reasons I think it makes more sense arguing in favour of a proper monetary target (NGDP level targeting) and a proper operational framework for the Fed than to waste a lot of time arguing about whether or not the Fed should implement QE3 or not. Monetary easing is badly needed both in the US and the euro zone, but discretionary changes in the present policy framework is likely to only have short-term impact. We could do so much better. David Glasner on why Steve is wrong opposing QE3. I agree with David’s critique of Steve’s views. My own post on why NGDP level targeting is the true Free Market alternative – we will only convince our fellow free marketeers if we focus on the policy framework rather than discretionary policy changes such as QE3. My post on QE in the UK. In my post I among other things discuss why Bank of England’s inflation target has undermined the bank’s attempt to increase nominal spending. This should be a lesson for the Federal Reserve when it hopefully implements QE3. See also my old post on QE without a proper framework in the UK. Over the last 1-2 decades so-called DSGE (dynamic stochastic general equilibrium) models have become the dominate research tool for central banks around the world. These models certainly have some advantages, but it is notable that these models generally are models without money. Yes, that is right the favourite models of central bankers are not telling them anything about money and the impact of money on the economy. That is not necessarily a major problem when everything is on track and interest rates are well above zero. However, in the present environment with interest rates close to zero in many countries these models become completely worthless in assessing monetary policy. I draw a number of conclusions from the paper. First, the authors clearly show that monetary policy is highly potent. 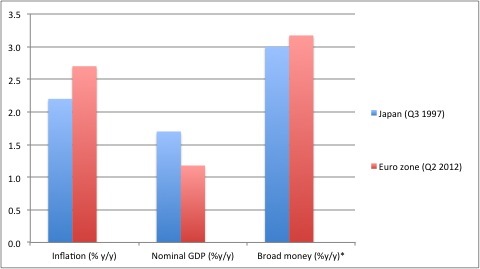 An increase in the money supply via QE will increase nominal GDP and in the short-run also real GDP. Second, the paper has a very good discussion of the monetary transmission mechanism stressing that monetary policy does not primarily work through the central bank’s key policy rate, but rather through changes in a number of asset prices. The authors’ discussion of the transmission mechanism and the empirical results also clearly refute that money and other assets are perfect substitutes. Therefore, unlike what for example has been suggested by Steven Williamson open market operations will impact nominal income. I particularly find the discussion of the so-called buffer stock theory of money interesting. The Buffer stock theory, which was developed by among others David Laidler, has had a particularly large impact on British monetarists and in general Bridges and Thomas seem to write in what Tim Congdon has called the British monetarist tradition which stresses the interaction between credit and money more than traditional US monetarists do. British monetarists like Tim Congdon, Gordon Pepper and Patrick Minford – as do Bridges and Thomas – also traditionally have stressed the importance of broad money more than narrow money. Even though I think the paper is extremely interesting and clearly confirms some key monetarist positions I must say that I miss a discussion of certain topics. I would particularly stress three topics. 1) A discussion of the property market in the UK monetary transmission mechanism. Traditionally UK monetarists have stressed the importance of the UK property market in the transmission of monetary policy shocks. Bridges and Thomas discuss the importance of the equity market, but the property market is absent in their models. I believe that that likely leads to an underestimation of the potency of UK monetary policy. Furthermore, Bridges and Thomas use the broad FTSE All Shares equity index as an indicator for the stock market. While this obviously makes sense it should also be noted that the FTSE index likely is determined more by global monetary conditions rather than UK monetary conditions. It would therefore be interesting to see how the empirical results would change if a more “local” equity index had been used. 2) The importance of the expectational channel is strongly underestimated. Even though Bridges and Thomas discuss the importance of expectations they do not take that into account in their empirical modeling. There are good reasons for that – the empirical tools are simply not there for doing that well enough. However, it should be stressed that it is not irrelevant under what expectational regime monetary policy operates. The experience from the changes in Swiss monetary and exchange rate policy over the last couple of years clearly shows that the expectational channel is very important. Furthermore, it should be stressed that the empirical results in the paper likely are strongly influenced by the fact that there was significant nominal stability in most of the estimation period. I believe that the failure to fully account for the expectational channel strongly underestimates the potency of UK monetary policy. That said, the BoE has also to a very large degree failed to utilize the expectational channel. Hence, the BoE has maintained and even stressed its inflation target during the “experiments” with QE. Any Market Monetarist would tell you that if you announce monetary easing and at the same time say that it will not increase inflation then the impact of monetary easing is likely to be much smaller than if you for example announced a clear nominal target (preferably an NGDP level target). In regard to the expectational channel it should also be noted that the markets seem to have anticipated QE from the BoE. As it is noted in the paper the British pound started to depreciate ahead of the BoE initiating the first round of QE. This presents an econometric challenge as one could argue that the start of QE was not the time it was officially started, but rather the point in time when it was being priced into the market. This of course is a key Market Monetarist position – that monetary policy (can) work with long and variable leads. This clearly complicates the empirical analysis and likely also leads to an underestimation of the impact of QE on the exchange rate and hence on the economy in general. 3) The unexplained odd behavior of money-velocity. One of my biggest problems with the empirical results in the paper is the behaviour of money-velocity. Hence, in the paper it is shown that velocity follows a V-shaped pattern following QE. Hence, first velocity drops quite sharply in response to QE and then thereafter velocity rebounds. The authors unfortunately do not really discuss the reasons for this result, which I find hard to reconcile with monetary theory – at least in models with forward-looking agents. In my view we should expect velocity to increase in connection with the announcement of QE as the expectation of higher inflation will lead to a drop in money demand. So if anything we should expect an inverse V-shaped pattern for velocity following the announcement of QE. This is also quite clearly what we saw in the US in 1933 when Roosevelt gave up the gold standard or in Argentina following the collapse of the currency board in 2002. I believe that Bridges and Thomas’ results are a consequence of failing to appropriately account for the expectational channel in monetary policy. A simple way to illustrate the expectational channel is by looking at Google searches for “QE” and “Quantitative Easing”. I have done that in Google Insights and it is clear that the expectation (measured by number of Google searches) for QE starts to increase in the autumn of 2008, but really escalates from January 2009 and peaks in March 2009 when the BoE actually initiated QE. It should also be noted that BoE Governor Mervyn King already in January 2009 had hinted quite clearly that the BoE would indeed introduce QE (See here). That said, M4-velocity did continue to drop until the summer of 2009 whereafter velocity rebounded strongly – coinciding with the BoE’s second round of QE. Despite my reservations about parts of Bridges and Thomas’ paper I think it is one of the most insightful papers on QE I have seen from any central bank and I think the paper provides a lot of insight to the monetary transmission mechanism and I think it would be tremendously interesting to see what results a similar empirical study would produce for for example the US economy. Josh Hendrickson has a great post on his blog The Everyday Economist on the monetary transmission mechanism. See also my earlier post “Ben Volcker” and the monetary transmission mechanism. “Will the ECB will stand by and let Spain go under? Spain is a nice country with a fairly large economy. It’d be a… shame, right? So if the ECB won’t do anything, I think the UK should act instead. David Cameron should immediately instruct the Bank of England to print Sterling, exchange it for Euros, and start buying up Spanish government debt. Spain apparently has about €570bn of debt outstanding, so the Bank could buy, say, all of it. We all know that the Bank of England balance sheet has no possible effect on the UK economy except when it is used to back changes in Bank Rate. Right? So these actions by the Bank can make no difference to, say, the Sterling/Euro exchange rate, and hence no impact on the demand for domestically produced goods and services in the UK. Right? Your reaction will probably be that Britmouse is mad. But you are wrong. He is neither mad nor is he wrong. British NGDP is in decline and the Bank of England need to go back to QE as fast as possible and the best way to do this is through the FX market. Print Sterling and buy foreign currency – this is what Lars E. O. Svensson has called the the foolproof way out of a liquidity trap. And while you are at it buy Spanish government debt for the money. That would surely help curb the euro zone crisis and hence reduce the risk of nasty spill-over to the British economy (furthermore it would teach the ECB as badly needed lesson…). And by the way why do the Federal Reserve not do the same thing? Obviously this discussion would not be necessary if the ECB would take care of it obligation to ensure nominal stability, but unfortunately the ECB has failed and we are now at a risk of a catastrophic outcome and if the ECB continues to refuse to act other central banks sooner or later are likely to step in. You can think of Britmouse’ suggestion what you want, but think about it and then you will never again say that monetary policy is out of ammunition. “Nickikt, no I certainly do not support bailing out either bank or countries. I should of course have wrote that. The reason why I wrote that this is a “cool idea” is that is a fantastic illustration of how the monetary transmission mechanism works and that monetary policy is far form impotent. So if you ask me the question what I would do if I was on the MPC of Bank of England then I would clearly have voted no to Britmouse’s suggestion. I but I 100% share the frustration that it reflects. That is why I wrote the comment in the way I did. Most Market Monetarist bloggers have a fairly US centric perspective (and from time to time a euro zone focus). I have however from I started blogging promised to cover non-US monetary issues. It is also in the light of this that I have been giving attention to the conduct of monetary policy in open economies – both developed and emerging markets. In the discussion about the present crisis there has been extremely little focus on the international transmission of monetary shocks. As a consequences policy makers also seem to misread the crisis and why and how it spread globally. I hope to help broaden the discussion and give a Market Monetarist perspective on why the crisis spread globally and why some countries “miraculously” avoided the crisis or at least was much less hit than other countries. In 2008 when crisis hit we saw a massive tightening of monetary conditions in the US. The monetary contraction was a result of a sharp rise in money (dollar!) demand and as the Federal Reserve failed to increase the money supply we saw a sharp drop in money-velocity and hence in nominal (and real) GDP. Hence, in the US the drop in NGDP was not primarily driven by a contraction in the money supply, but rather by a drop in velocity. The European story is quite different. In Europe the money demand also increased sharply, but it was not primarily the demand for euros, which increased, but rather the demand for US dollars. In fact I would argue that the monetary contraction in the US to a large extent was a result of European demand for dollars. As a result the euro zone did not see the same kind of contraction in money (euro) velocity as the US. On the other hand the money supply contracted somewhat more in the euro zone than in the US. Hence, the NGDP contraction in the US was caused by a contraction in velocity, but in the euro zone the NGDP contraction was caused to drop by both a contraction in velocity and in the money supply. Reflecting a much less aggressive response by the ECB than by the Federal Reserve. Second, it is completely key how monetary policy responded to the change in money demand. The Fed failed to increase the money supply enough to the increase in the dollar demand (among other things because of the failure of the primary dealer system). On the other hand the Swiss central bank (SNB) was much more successful in responding to the sharp increase in demand for Swiss franc – lately by introducing a very effective floor for EUR/CHF at 1.20. This means that any increase in demand for Swiss franc will be met by an equally large increase in the Swiss money supply. Had the Fed implemented a similar policy and for example announced in September 2008 that it would not allow the dollar to strengthen until US NGDP had stopped contracting then the crisis would have been much smaller and would long have been over. Why was the contraction so extreme in for example the PIIGS countries and Russia? While the Fed failed to increase the money supply enough to counteract the increase in dollar demand it nonetheless acted through a number of measures. Most notably two (and a half) rounds of quantitative easing and the opening of dollar swap lines with other central banks in the world. Other central banks faced bigger challenges in terms of the possibility – or rather the willingness – to respond to the increase in dollar demand. This was especially the case for countries with fixed exchanges regimes – for example Denmark, Bulgaria and the Baltic States – and countries in currencies unions – most notably the so-called PIIGS countries. I have earlier showed that when oil prices dropped in 2008 the Russian ruble started depreciated (the demand for ruble dropped). However, the Russian central bank would not accept the drop in the ruble and was therefore heavily intervening in the currency market to curb the ruble depreciation. The result was a 20% contraction in the Russian money supply in a few months during the autumn of 2008. As a consequence Russia saw the biggest real GDP contraction in 2009 among the G20 countries and rather unnecessary banking crisis! Hence, it was not a drop in velocity that caused the Russian crisis but the Russian central bank lack of willingness to allow the ruble to depreciate. The CBR suffers from a distinct degree of fear-of-floating and that is what triggered it’s unfortunate policy response. The ultimate fear-of-floating is of course a pegged exchange rate regime. A good example is Latvia. When the crisis hit the Latvian economy was already in the process of a rather sharp slowdown as the bursting of the Latvian housing bubble was unfolding. However, in 2008 the demand for Latvian lat collapsed, but due to the country’s quasi-currency board the lat was not allowed to depreciate. As a result the Latvian money supply contracted sharply and send the economy into a near-Great Depression style collapse and real GDP dropped nearly 30%. Again it was primarily the contraction in the money supply rather and a velocity collapse that caused the crisis. The story was – and still is – the same for the so-called PIIGS countries in the euro zone. Take for example the Greek central bank. It is not able to on it’s own to increase the money supply as it is part of the euro area. As the crisis hit (and later escalated strongly) banking distress escalated and this lead to a marked drop in the money multiplier and drop in bank deposits. This is what caused a very sharp drop in the Greek board money supply. This of course is at the core of the Greek crisis and this has massively worsened Greece’s debt woes. Therefore, in my view there is a very close connection between the international spreading of the crisis and the currency regime in different countries. In general countries with floating exchange rates have managed the crisis much better than countries with countries with pegged or quasi-pegged exchange rates. Obviously other factors have also played a role, but at the key of the spreading of the crisis was the monetary policy and exchange rate regime in different countries. Why did Sweden, Poland and Turkey manage the crisis so well? While some countries like the Baltic States or the PIIGS have been extremely hard hit by the crisis others have come out of the crisis much better. For countries like Poland, Turkey and Sweden nominal GDP has returned more or less to the pre-crisis trend and banking distress has been much more limited than in other countries. What do Poland, Turkey and Sweden have in common? Two things. First of all, their currencies are not traditional reserve currencies. So when the crisis hit money demand actually dropped rather increased in these countries. For an unchanged supply of zloty, lira or krona a drop in demand for (local) money would actually be a passive or automatic easing of monetary condition. A drop in money demand would also lead these currencies to depreciate. That is exactly what we saw in late 2008 and early 2009. Contrary to what we saw in for example the Baltic States, Russia or in the PIIGS the money supply did not contract in Poland, Sweden and Turkey. It expanded! I could also have mentioned the Canada, Australia and New Zealand as cases where the extent of the crisis was significantly reduced due to floating exchange rates regimes and a (more or less) proper policy response from the local central banks. Some countries fall in the category between the PIIGS et al and Sweden-like countries. That is countries that suffer from an indirect form of fear-of-floating as a result of inflation targeting. The most obvious case is the ECB. Unlike for example the Swedish Riksbank or the Turkish central bank (TCMB) the ECB is a strict inflation targeter. The ECB does target headline inflation. So if inflation increases due to a negative supply shock the ECB will move to tighten monetary policy. It did so in 2008 and again in 2011. On both occasions with near-catastrophic results. As I have earlier demonstrated this kind of inflation targeting will ensure that the currency will tend to strengthen (or weaken less) when import prices increases. This will lead to an “automatic” fear-of-floating effect. It is obviously less damaging than a strict currency peg or Russian style intervention, but still can be harmful enough – as it clear has been in the case of the euro zone. I hope to have demonstrated above that the increase in dollar demand in 2008 not only hit the US economy but also lead to a monetary contraction in especially Europe. Not because of an increase demand for euro, lats or rubles, but because central banks tighten monetary policy either directly or indirectly to “manage” the weakening of their currencies. Or because they could not ease monetary policy as member of the euro zone. In the case of the ECB the strict inflation targeting regime let the ECB to fail to differentiate between supply and demand shocks which undoubtedly have made things a lot worse. The international transmission was not caused by “market disorder”, but by monetary policy failure. In a world of freely floating exchange rates (or PEP – currencies pegged to export prices) and/or NGDP level targeting the crisis would never have become a global crisis and I certainly would have no reason to write about it four-five years after the whole thing started. Obviously, the “local” problems would never have become any large problem had the Fed and the ECB got it right. However, the both the Fed and the ECB failed – and so did monetary policy in a number of other countries. DISCLAIMER: I have discussed different countries in this post. I would however, stress that the different countries are used as examples. Other countries – both the good, the bad and the ugly – could also have been used. Just because I for example highlight Poland, Turkey and Sweden as good examples does not mean that these countries did everything right. Far from it. The Polish central bank had horrible communication in early 2009 and was overly preoccupied the weakening of the zloty. The Turkish central bank’s communication was horrific last year and the Sweden bank has recently been far too reluctant to move towards monetary easing. And I might even have something positive to say about the ECB, but let me come back on that one when I figure out what that is (it could take a while…) Furthermore, remember I often quote Milton Friedman for saying you never should underestimate the importance of luck of nations. The same goes for central banks. PS You are probably wondering, “Why did Lars not mention Asia?” Well, that is easy – the Asian economies in general did not have a major funding problem in US dollar (remember the Asian countries’ general large FX reserve) so dollar demand did not increase out of Asia and as a consequence Asia did not have the same problems as Europe. Long story, but just show that Asia was not key in the global transmission of the crisis and the same goes for Latin America. PPS For more on the distinction between the ‘monetary disorder view’ and the ‘market disorder view’ in Hetzel (2012).